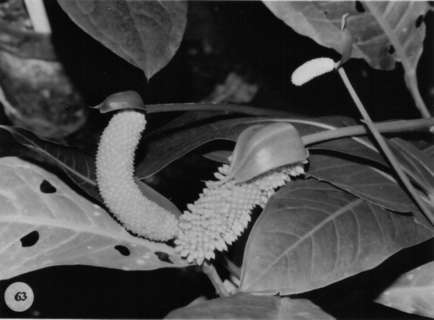 Anthurium cuneatissimum (Engl.) Croat, comb. nov.
Anthurium consobrinum var. cuneatissimum Engl., Pflanzenr. IV 23B: 176. 1905. TYPE: Costa Rica. Lim—n: Llanuras de Santa Clara, 250 m, Donnell Smith 6811 (B, holotype; US, isotype). Epiphyte; stems very short; roots dense, descending, fuzzy (dried), ca. 3 mm thick; cataphylls coriaceous, 6-9 cm long, acuminate at apex, drying tan (B & K Red 9/10), weathering into longitudinal fibers. LEAVES erect-spreading; petioles usually quadrangular with sharp edges, sometimes bluntly angular abaxially, often with a sharp medial rib abaxially, 6-32(40) cm long, 5-7 mm wide; geniculum 0.8-2.5 cm long; blades obovate-elliptic, subcoriaceous; (20)25-60 cm long, 8.5-21 cm wide, long-acuminaic at apex, acute to cuncate at base; upper surface semiglossy to glossy, lower surface semiglossy; the midrib broad, scarcely raised above, sometimes with a weak medial rib, narrowing and sunken at apex, prominently raised below, sometimes with 1-2 sharp ribs; primary lateral veins (5)10-15 per side, departing midrib at 30°-40° angle, ± straight to collective vein or weakly arcuate-ascending, raised in shallow valleys above, raised below; lesser veins flat above, flat and conspicuous below; collective vein arising from one of the primary lateral veins, 1-3 mm from the margin. INFLORESCENCE erect-spreading, usually shorter than leaves; peduncle 21-58 cm long, sharply 1 -ribbed abaxially, 2-4-ribbed from base to just above middle; spathe ovate, cucullate, dark green, coriaceous, 2.5-6(9) cm long, 2.1-4 cm wide, abruptly to gradually acuminate at apex, rounded to truncate at base, inserted at 50°-70° angle on peduncle; spadix sessile, clavate, pale yellow-green or lemon-yellow, 1.9-5 cm long, ca. 8 mm diam. midway, weakly tapered at base, round at apex; flowers 4-lobed, 1.6-2.2 mm long, 2-2.5 mm wide, the sides jaggcdiy sigmoid; 16-20 flowers visible in the principal spiral, 13-16 flowers visible in the alternate spiral; lepals matte, conspicuously papillate, lateral tepals 0.6-0.9 mm wide, the inner margin straight to convex and turned up against pistil; the pistil emergent to 0.5 mm, white to pale greenish-white; sligma brushlike, ca. 0.2 mm long, with small droplets ca. 2 weeks before drying, 2-3 days before first stamens emerge; lateral stamens emerging simultaneously on all flowers, soon followed by third and fourth stamens, exserted on long, whitish filaments, 0.3-1 mm long, 0.2-0.3 mm wide, which slowly retract holding anthers in a tight circle around and above pistil; anthers pale yellow, 0.3-0.4 mm long, 0.5-0.6 mm wide; thecae ellipsoid; pollen pale yellow fading to white. INFRUCTESCENCE with spadix 5-11 cm long; berries obovoid, greenish-yellow to white, 4-4.3 mm long, 2.5 mm thick, sharply pointed at apex; seeds 2. Fig. 63. Anthurium cuneatissimum is known from the Atlantic slopes in Costa Rica and Panama in tropical wet forest life zones from 20 to 450 m elevation in Costa Rica and at much higher elevations of 800 to 1,000 m in Panama. The species is in section Pachyneurium and is distinguished by its long, usually quadrangular, sharply margined petiole, broad leaf blade, cupulate, coriaceous, ovale spathe, short clavate, lemon-yellow spadix, and white obovoid berries. It is confused only with A. spathiphyllum, which shares a similar short clavale, sometimes yellowish spadix. That species differs, however, in having much narrower leaves with 20-30 prominently sunken primary lateral veins (versus (5) 10-15 scarcely sunken veins for A. cuneatissimum), commonly 3-sided petioles, and a spathe that is lanceolate to broadly lanceolate and about twice as long as the spadix (versus ovate and about as long as the spadix for A. cuneatissimum). This species was not distinguished in the treatment of the genus Anthurium for Costa Rica (Croat & Baker, 1979) even though we initially had material separated along these lines before finding that the 3-sided versus 4-sided petiole character breaks down. Special thanks go to Michael H. Grayum (University of Massachusetts) for pointing out additional characters that made their separation possible.